Kevin Humphreys is General Manager for Merchant & Gas Carrier Segment sales at Wartsila, Inc. Wartsila is a leading global provider of equipment, technology, and services in the marine, oil & gas, and power industries. Kevin has held various positions at Wartsila for the past seven years. 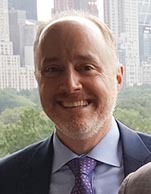 Kevin has 25 years of experience as a senior executive and manager in a variety of fields including private equity and venture capital backed start-ups, OEM, software, international shipping, and government. Among his significant previous positions, Kevin served as CEO and Chief Operating Officer of Fifth Street Development and Senior Vice President of Engineering & Business Development at Marorka USA. Before entering the private sector, Kevin was a Special Agent with The Federal Bureau of Investigation, sailed as a licensed chief engineer in the merchant marines, and served as an officer in the US Naval reserve. Kevin is a graduate of the United States Merchant Marine Academy with a Bachelor of Science degree in marine engineering systems, holds a Chief Engineers License Unlimited steam and diesel, and has a Masters of Arts degree in the Philosophy and Theology of Science from Biola University.